Michael Harker drove past old barns on gravel roads and blacktop highways for years. He generally dismissed them as obsolete outbuildings until November 1993, when he felt compelled to photograph a windmill in Clutier, Iowa. This single photograph launched him on a seven-and-a-half-year mission to document Iowa's barns and all they represent. 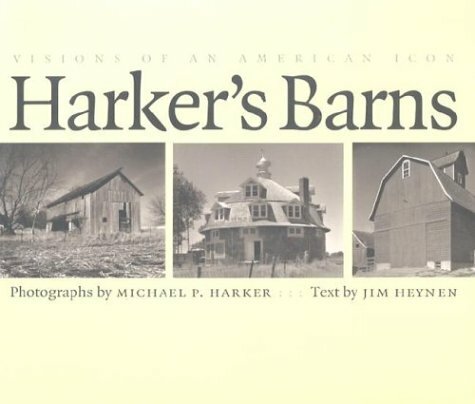 The result is Harker's Barns: Visions of an American Icon. Each of the seventy-five black-and-white images featured in Harker's Barns beautifully and heartbreakingly captures the glory and ultimate demise of one of rural America's most enduring icons. From square to round, wood to brick, Dutch to Swedish, occupied or abandoned, the barns documented in this stunning collection are a testament to a passing way of life that was once the lifeblood of Iowa and the Midwest. Complementing Harker's photographs are vignettes by poet and writer Jim Heynen. Both whimsical and endearing, each vignette treats barns as organic and intelligent entities, reflecting the living history that can be found inside each rural structure.